VOYPIC (Voice of Young People in Care) invited everyone to be part of Care Day on Friday 16 February. The feedback is simple – “Best ever Care Day” and it really was an A to Z of activity from early morning till late in the evening. 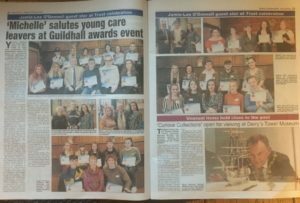 From awards for achievements to a Zoom call to young people in care in New Zealand, we spent the whole day with the focus on care, children and care leavers. 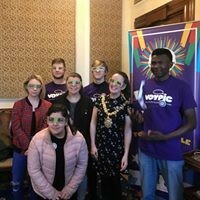 Some children and young people enjoyed an informal get-together in the Lord Mayor’s Parlour in Belfast City Hall while a huge gathering in Derry city’s Guild Hall celebrated children and young people of the Western Health and Social Care Trust. The Care Day campaign is the world’s biggest opportunity to recognise, promote and celebrate the rights of children and young people with care experience. This was only our third Care Day and it’s already a red letter day on the calendar of children in care, care leavers and the people who support and care for them. And, what’s more, the campaign is not limited to Northern Ireland – VOYPIC is part of Five Nations, One Voice – a collaboration with like-minded organisations in England, Scotland, Wales and the Republic of Ireland and they all celebrated Care Day in their own way. 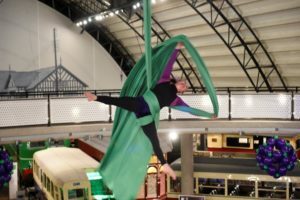 A highlight this year in Northern Ireland was the grand finale – Night at the Museum – an evening of fun, food and festivity at the Ulster Transport Museum, Cultra. 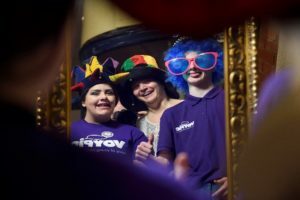 Children, young people, foster carers and families joined VOYPIC to party alongside social workers and professionals all of whom are part of the care family. Koulla, the Northern Ireland Commissioner for Children and Young People made the most of the party fun and games – here she is pictured with Stacie and Craig. Another highlight that enthralled families and guests was a display of aerial acrobatics – the VOYPIC colours were really flying high for #CareDay18! There are almost 3,000 children in care in Northern Ireland and each one of them has their own story. That story may explain why they came into care as well as telling the tale of their life with their foster carers, their social worker, their family and friends. Some stories may be hard hitting and reflect real challenges but there are also stories of resilience, hope and success. Young people do need privacy about their lives, but they also want to share their positive stories and images of care. On Care Day, we challenged the negative and celebrated the positive messages and stories instead.